Hi ladies! I'm finally back after my long absence. I've been back home now for a few days but I've been so rundown I haven't felt like doing much at all let alone come home and blog after work. Plus I got food poisoning a few days ago argh! So annoying! Anyway, here is my haul post for you all which is much requested every time I go to Hong Kong =) I didn't have a lot of time to shop this trip but I actually came home with nearly the same amount of stuff as I usually do or more even *shakes head* I work better under pressure what can I say! Looking at my previous HK haul posts they all sort of look similar.. I always tend to stock up on the same brands and things haha. WARNING: This post is INSANELY pic heavy! I was going to split it into 2 posts but I couldn't be bothered xp I'm making up for not blogging for so long I guess! I'm not responsible for creating any lemmings! My nail polish haul for this trip. Not a lot because I have a crazy amount of untrieds! I limited myself to picking up some lemmings which included Color Club Where's the Soiree, OPI Alpine Snow (I needed a new bottle), 3 of the Essie Luxeffects and Zoya Roxy. The BK holos are getting discontinued so I stocked up on a few colours to include in swaps. Also a Lajour duochrome recommended to me by my fellow polish and food lover Abby. Thanks for the tip Abby! Also two magnetic polishes from a random brand I came across too. These Canmake polishes deserve a pic on their own! 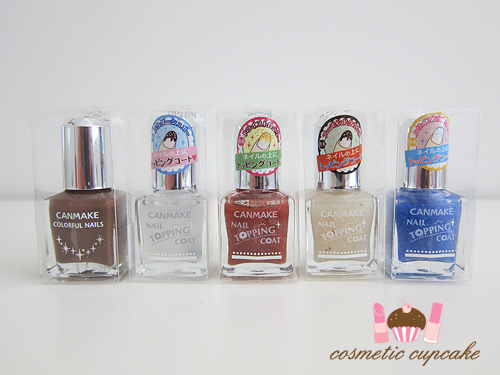 These are their new Nail Topping Coat polishes to create easy ice-cream nail art. They also released a chocolate coloured polish (pictured on the left) with some adorable pastels to help create the look. I was itching to get the pastels too but had to show restraint every time I walked past a Canmake counter since I have dupes at home =( I am SUPER excited to try these out! Some nail art stuff! 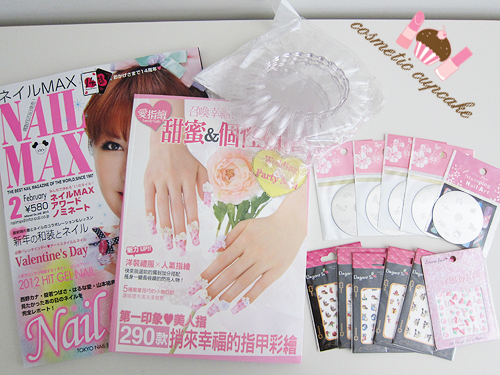 Nail mags of course including a Chinese one I came across with "wedding nail art". Ummmmmm very questionable wedding nail art but oh well haha (the mag came shrink wrapped so I couldn't see what it was like 1st doh). Also some nail wheels and some of the new Konad plates and nail decals. 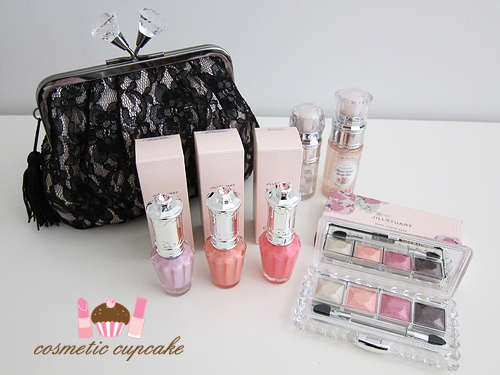 Some stunning items from the Jill Stuart Bare Petal 2012 Spring collection!! You can check out the full collection here. My sis helped me get these on the day the collection was released yay x) I got the three nail lacquers in flower shower, milky freesia, floret bud and also the Jewel Crystal Eyes palette. The pretty lace clutch was GWP along with the body mists. 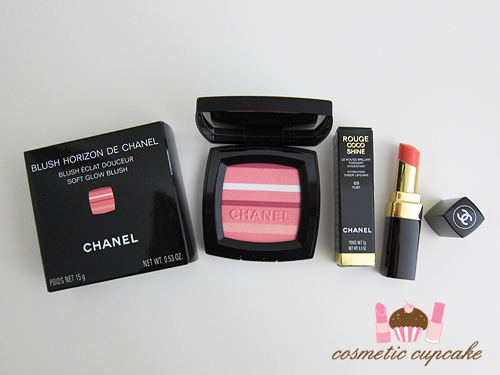 I walked into Chanel determined to only purchase Rouge Coco Shine in Flirt but was very easily somehow persuaded into purchasing the Blush Horizon de Chanel after trying it on XDDDD It is so so gorgeous! It's my 1st Chanel blush woot! 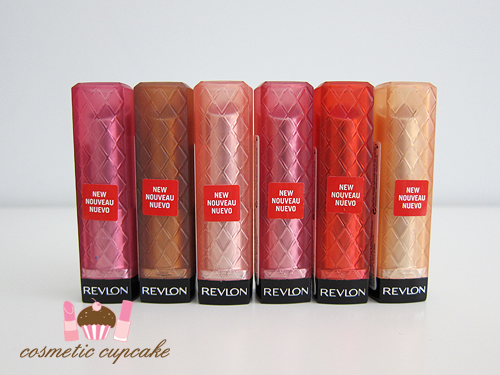 The much hyped about Revlon Colorburst lip butters!!! I got so excited when I saw these as I was hoping and hoping before I left Sydney that HK would have these!! There are 10 shades available from memory in HK. Teeny MAC haul. I had to pick up a new Studio Finish concealer and Brow Set and ended up getting Mineralize Skinfinish in Redhead too. Every time I passed a counter I picked it up so my sis told me to "just bloody get it". So I did lol. 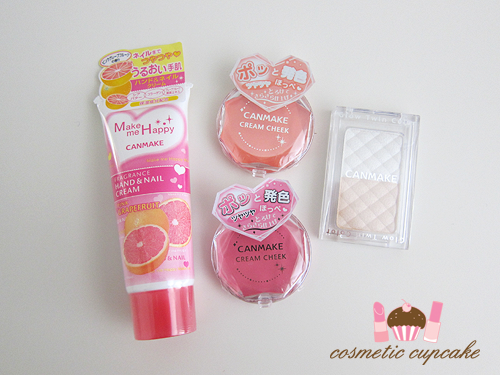 Canmake goodies! I ADORE their cream cheek blush so picked up their new shade in 12 (the peach) and also a 03 which is a light pink. The Make Me Happy hand cream is a new addition to the line and smells soooooooo good. I got Grapefruit and they have 4 other yummy smelling ones too. I also got the Glow Twin Color in 01. Dolly Wink mascaras and Eyelash Fix. I'd heard such good things about them I definitely had to pick them up! I'm using the Volume mascara at the moment and LOVING it. 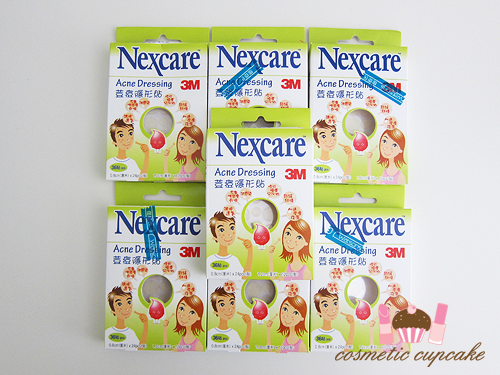 My sis and I stocked up on Nexcare Acne Dressings! I always get so many pesky pimples and these work well. 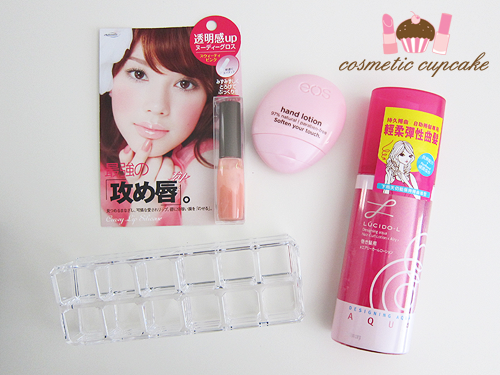 Some miscellaneous beauty items - a plumping lipgloss, EOS hand lotion, Lucido-L Designing Aqua Hair Curl Lotion and a lipstick holder. Onto some skincare! Clinique even better clinical, turnaround concentrate extra radiance renewer, moisture surge eye masks and Bottom Lash mascara and some samples. 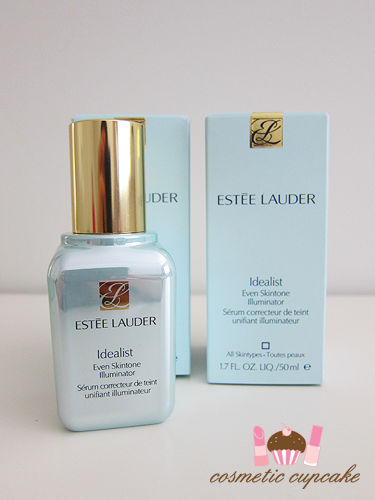 Two bottles of Estee Lauder Idealist Even Skintone Illuminator. When I went out with my awesome tweep Michelle a little while ago she suggested I try this out. She helped me get a sample from DJs and I liked it a lot so decided to stock up! 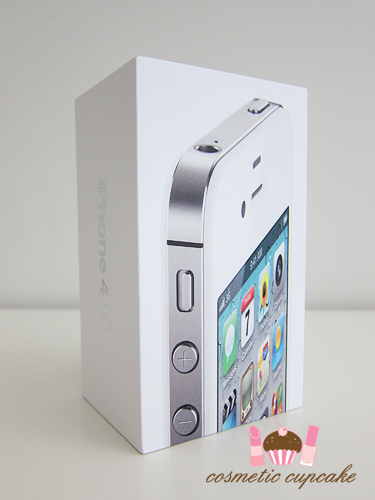 The biggest purchase of my trip - a white iPhone 4S!!!! *squeal* I decided it was time to upgrade my (secondhand) 3GS and boy am I happy I did. It is such an awesome phone! I hate paying more than $500 for a phone but considering I use my phone more than anything else I own it's totally worth it. I picked up four cases because I like to have different cases for different occasions lol. I clearly have a thing for dots and Hello Kitty x) I purchased them all at Ladies Market in Mongkok for $40HK each so only $5Aus!! My accessories haul. 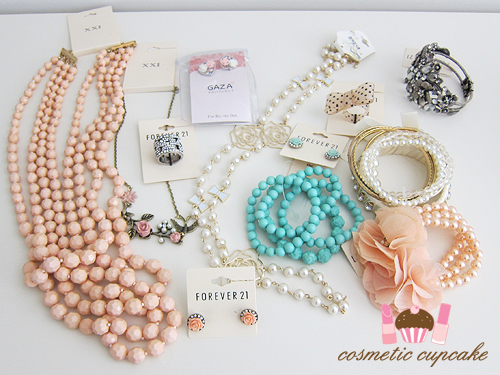 Most of these items are from Forever 21 which opened up while I was there! My sister and I were so excited when we found out they were opening up in HK. 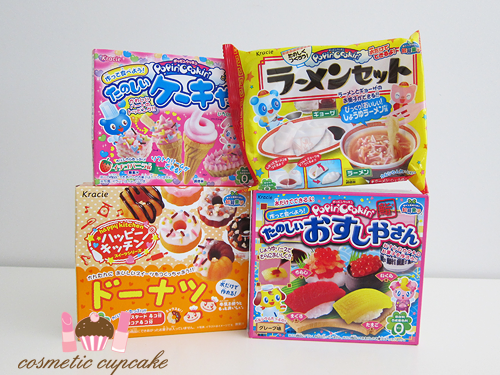 Kracie Popin'Cookin' kits! I was ecstatic to find these. If you haven't seen RRCherrypie's YouTube channel then I suggest you do. I am OBSESSED with his videos and he is just all sorts of AWESOMESAUCE. My massive Rilakumma I picked up at the Chinese New Year Fair XD Every time I spend Chinese New Year in HK I have to pick up an animal toy from the fair. 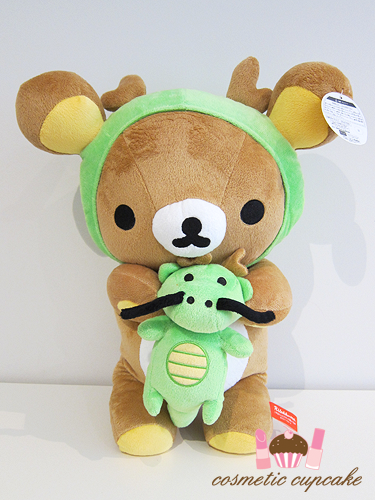 This was the cutest out of all the dragon soft toys I saw! If you made it this far - thank you!! I also hauled some clothes and shoes and other random things but they aren't that exciting. 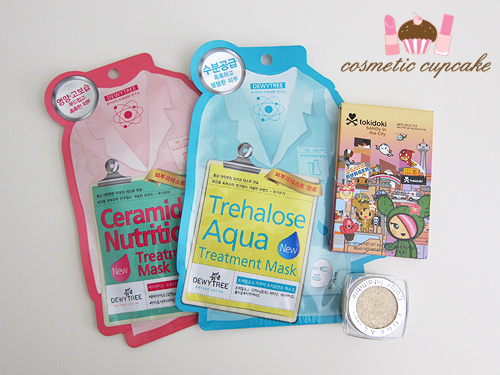 Now I'm on a serious spending ban what with so many things to save for =( I hope you enjoyed this post! Oh wow, I am jealous. I did not know Canmake was sold outside of Japan. Do you by any chance know whether their products are cheaper there than in Japan, or do they sell for the same price? What an overdose of cuteness! Those cooking kits look awesome, I'm going to have to track them down, even though I'm not sure what they are.. I see ice cream, sushi and donut..
What an amazing haul! Hope you're recovering from food poisoning. I came home from HK with food poisoning. Boo! Can't wait to see you rock the nail polishes you got. Especially Zoya's Roxy. I have Blair and I think it looks similar? Also, where did you find the lipstick holder? I was looking for them in Sasa and Bonjour, and didn't see any! I got the Clinique eye masks as well! Can't wait to use them! 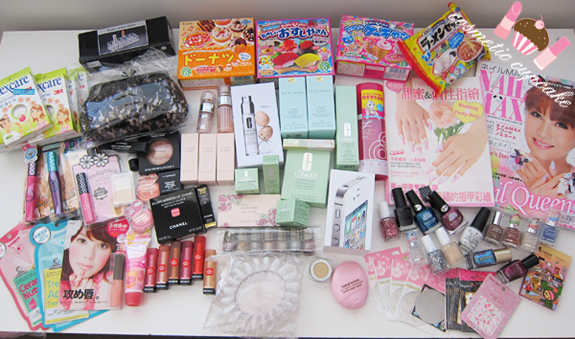 Gah, looking at your haul makes me want to go to HK again! AHAH. Welcome back! OMG 'chelle!! they are awesome!! :D you always get the most cutest things back from ur HK trip! I esp love the hello kitty's'!! OMG!!!! that's a nice haul! 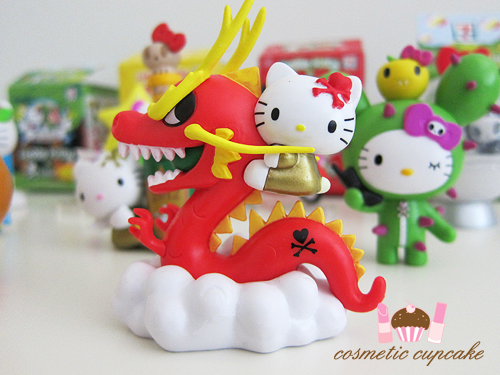 i love the tokidoki figurines!!! now i have to hunt for them for myself!!! Beautiful things!I'm in love with my dolly wink yellow nail polish but I haven't anything more. so nice to have you back :)! Thanks for sharing your haul!!! Whenever I visit HK, I pick up Clinique, Laneige, and Canmake :P I love the iphone case that you picked up with the black rim and the bow! super cute!!! wowwwwwwww ... !!! i love Hong Kong so much and i think shopping in Hong Kong is so much more fun than in any other places!! That Jill Stuart Pouch is amazing! I would buy a bunch of things just to get that. 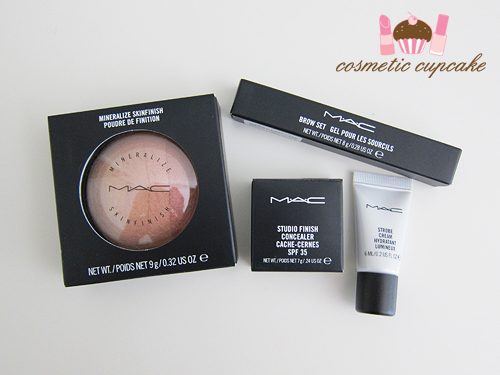 :) MAC MSF...Im so bummed out that I missed that item. But oh well, Mac repromotes like crazy. IPHONE, Im so jealous. Loved this haul! I totally need to freshen up my cosmetics for the new year! I recently got one of the Revlon lip butters and wasn't too happy with the shade but want to try a different one- the one I got was a hot pink and it was more opaque than I'd predicted! I'm glad you had such a great time sweety!! My hubby and I "might" plan a trip to Beijng this year, looking at your goodies I hope i can get some there as well. I hope your grandma is better!! LOVED THIS POST! It's also so awesome looking at what others buy when on holidays and half-feeling like you would have done the same... and also half-feeling better for spending a lot on your own holiday ;) Which reminds me, need to blog about my week in San Francisco! Omg a beautiful and impressive haul! The first time I came across your blog was right when you had posted about your haul from last year's trip to HK - been really looking forward to this post! The Rilakumma plush is so cute! The dragon is adorable!! 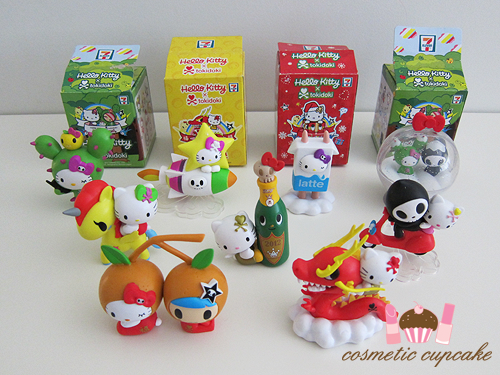 I wish tokidoki figures were sold at 7 Elevens in the US. Wauw, wat een ontzettend leuke aankopen, en zoveel! WOW!!! What an amazing haul!! Lots of pretty things.. 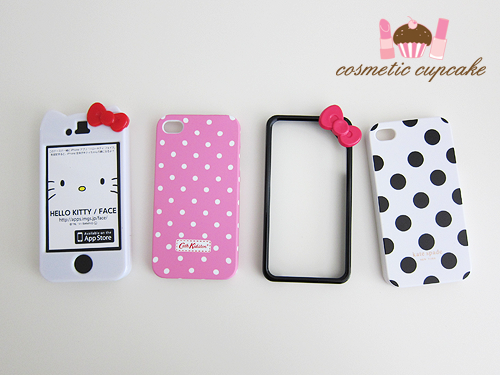 I have one of those hello kitty phone covers on its way to me now :) So cute! AMAZING haul! It looks like you were able to get a lot that you really wanted to get! 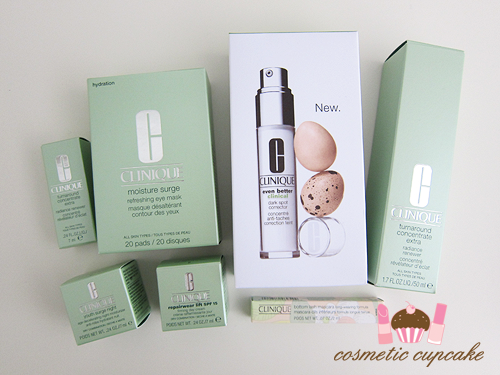 I can't wait to see your reviews on some of the products especially Clinique and the new Canmakes! Do you really have where to keep all that stuff??? Wow! looks like you picked up some really awesome stuff! Great haul! my daughter's been bugging me to buy the kracie cooking sets. where to you get get them? Hey! Where did you get the nail polishes and the swatch wheels? I am planning to go to Hong Kong soon and I would love to know where you got them. I am running out of nail wheels and I am desperate and crazy in them.